Home / Main / Could You Work With Your Spouse? When Gene & Julie Gates wed in New York City’s Grand Central Terminal, The New York Times covered the story. When Oprah Winfrey heard about Gene & Julie she invited them as guests on her show. Gene & Julie Gates are a dynamic husband-and-wife broadcasting duo whose morning radio show has aired in Los Angeles, San Francisco, Dallas, Atlanta and Raleigh. 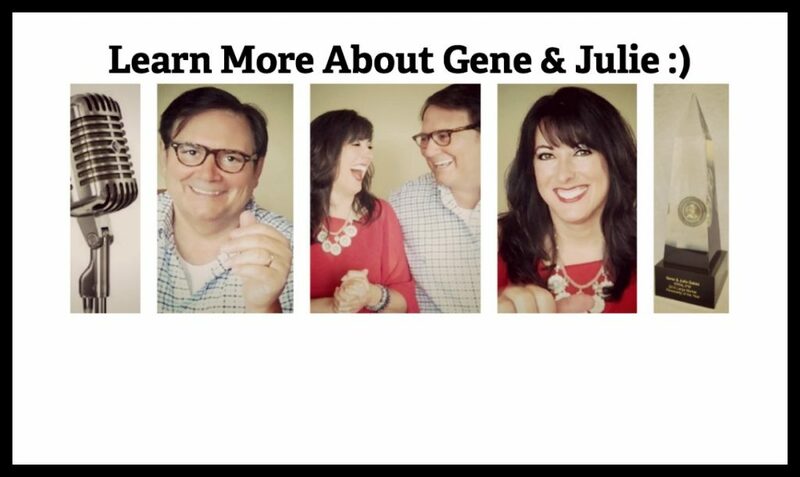 The Gene & Julie Show is “Positively Hilarious,” and they find humor in marriage, relationships and pop culture. The show is viral– Gene & Julie have been featured on American Idol, HuffPost Live, CNN, CMT, ABC’s Nightline, NBC Nightly News, and in USA Today, The Wall Street Journal and PARADE Magazine. Recognized as one of the best radio shows in America, in 2015 Gene & Julie won the Marconi Award for “Large Market Personality of the Year” from the National Association of Broadcasters. Gene & Julie are also relationship experts. No matter where they go, everyone asks, “How do you live and work together without killing each other?” They share their strategies for a successful love/work partnership in magazine columns, on HuffPost Live and through their Working Couple Network blog—a place where they support and promote couples who work together. Gene & Julie also deliver their “Ignite Your Couple Power” relationship workshop to convention audiences of all sizes. When the microphones are off, they are entrepreneurs who owned and operated Battuto Italian Kitchen in Dallas (which was deemed a “Top 100 Best Neighborhood Gem Restaurants in America” by OpenTable). Gene & Julie also have a voice over business. But the center of their universe is their 14-year-old daughter Sophia. As a family they enjoy spending hours in bookstores, walking their dog Reggie and watching Shark Tank. Want to hear audio of The Gene & Julie Show? Click here. Next article Oh, No You Didn't!